Send your little one into a deep and magical sleep with this lovely Peter Rabbit Musical Carousel. 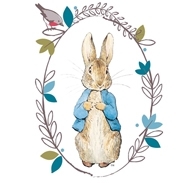 With wooden, hand-painted figurines of Peter Rabbit, Jemima Puddle Duck, Mr. Jeremy Fisher and a cute little robin, fans of Beatrix Potter will love watching their favourite characters turn as the carousel spins. Painted in soft blue with sweet garden prints, this musical carousel would make a wonderful gift or keepsake. Simply twist the carousel and watch the figures as they go round and round to the tune of the music. The perfect soothing aid in sending a little one to sleep, this musical carousel is the perfect decorative keepsake.